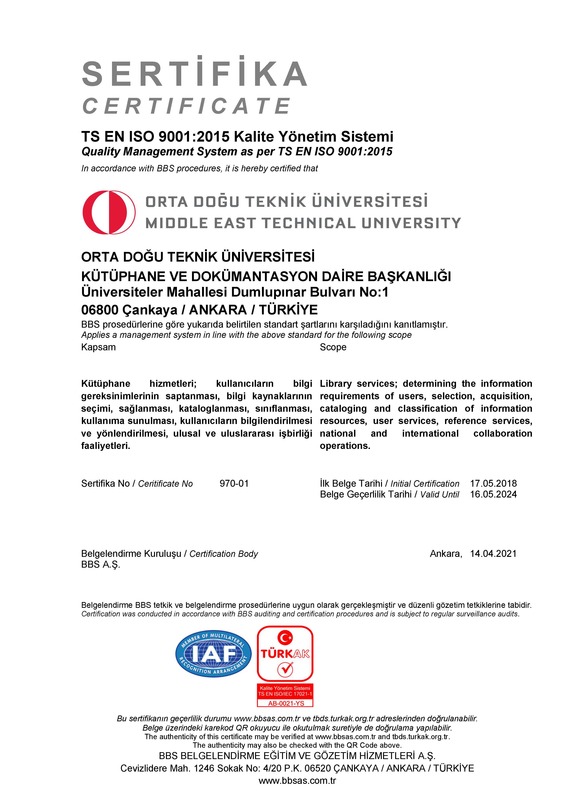 ODTÜ Library and Documentation Directorate started to ISO 9001:2008 Quality Management System on July 1, 2011 and entitled to Certificate of Quality on April 25, 2012. Scope of ODTÜ Library services is defined as identification of the information requirements of users, choice of information sources, selection, provision, classification, cataloging and submission of information sources to users, informing and directing users, and national and international cooperation activities. In May 2018, the Library provided Certificate of Quality for the new revision of the standard by reorganizing the studies carried out in accordance with international standards as defined by the Library. 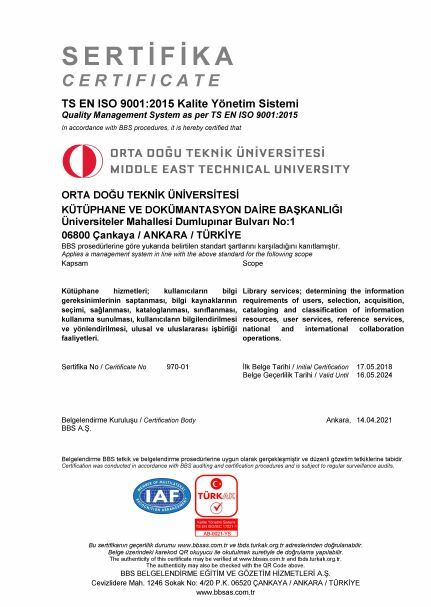 In ODTÜ Library, Quality Management System has been constituted, documented, and necessary mechanisms have been established to ensure continuity and to constantly improve the Library in accordance with the requirements stipulated by the ISO 9001: 2015 Quality Management System standards. ODTÜ Library creates all its services based on the information requirements of the users and accepts user satisfaction as a basic indicator of service quality. We are here to provide qualified, accurate, reliable and universal information with contemporary and effective access for educational and research activities, community service and to be an exemplary library within METU. METU Library has all kinds of modern technology and physical facilities suitable for future learning needs. It is a powerful, rich information and document center that can provide the best service to all internal and external shareholders independent from time and place, and has succeeded to be a reference in its region. While METU Library adopts the values of our university, it regards the traditional values of information services that are respecting to freedom of thought, conformity to occupational ethics, outstanding service, and cooperation, satisfaction of users and Library staff and service quality. METU Library staff are hardworking, honest, and respectful, have the team spirit and adopted scientific and ethical rules of work, and are individuals who constantly develop themselves and proud of the institution they work for. ODTÜ Head Office of Library and Documentation assures that the confidentiality, integrity and availability of information are preserved from all intentional or accidental threats that are internal and/or external, and that the information security will work correctly, effectively, quickly and safely. In this context, ODTÜ Library is entitled to receive an Information Security Management System certificate together with ODTÜ Information Technology Department in December 2017 by incorporating the principles of Information Security Management System into business processes in July 2017.